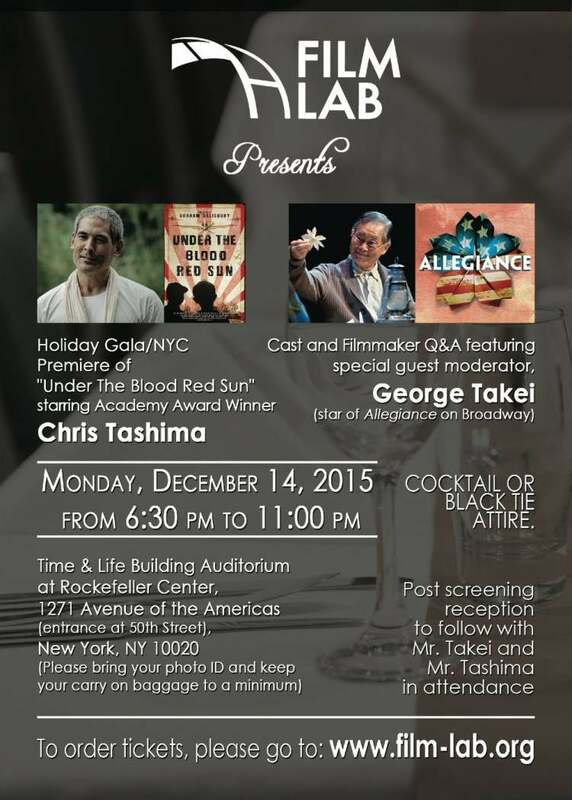 The Film Lab's annual Fundraising Gala is to be held at Rockefeller Center on December 14th with the premiere of Under The Blood Red Sun, along with the cast and filmmaker Q&A featuring special guest, George Takei, and Chris Tashima. NEW YORK - Nov. 19, 2015 - PRLog -- The 3rd annual Film Lab fundraising holiday gala has officially been announced for 2015. The 501(c)(3) charity, which promotes ethnic and gender diversity through outreach, education, and production, will be holding their largest gala to date at Rockefeller Center in New York City on Monday, December 14, 2015, from 6:30pm to 11pm. The black tie event will feature special guest moderator, George Takei. All tickets sales will go towards diversity in media initiatives. These much needed donations will go towards providing free or low-cost programming that includes screenwriting workshops, panels, seminars and screenings and are tax-deductible to the fullest extent of the law. The event will feature the NYC Premiere of Under The Blood Red Sun, starring Academy Award Winner Chris Tashima. This film was based on the bestselling novel of the same title by Graham Salisbury and details the life of Tomi––a Japanese American boy whose family was sent to the internment camp during World War II. Following the film screening, there will be a Q&A with the cast that will be moderated by George Takei. Takei is well known by fans for his role in Star Trek, along with the decades of advocacy work within the Asian American and LGBT community. His starring role in the Broadway musical ‘Allegiance’ is his latest professional endeavor. Guests will also be invited to join the Film Lab for the post-screening reception and will have the opportunity to share food and drink with the cast and Mr. Takei himself. Founded in 1998, The Film Lab is a not-for-profit corporation with members across the globe consisting of diverse filmmakers, directors, producers, writers, editors, actors, and crew members. The organization provides monthly programs to support gender and ethnic diversity in film and television. The Film Lab works to promote education and support ethnic and gender diversity in films and television through a series of programs and events that include Unfinished Works, a program for writers; Industry Spotlight, a program for filmmakers; Connections, a networking arm that encompasses the Film Lab's famous 72-Hour Shootout filmmaking competition and the Lab's Annual Holiday Gala; and AAFL TV, the Lab's production arm. For media inquiries regarding The Film Lab, contact Industry Spotlight Coordinator, Nick Sakai directly at 646-535-5212 or via email at industryspotlight@film-lab.org. To learn more about the organization, please visit: www.film-lab.org. : The Asian American Film Lab, Inc.